THE AMOUNT OF INVESTMENT IN THE TOURISM SECTOR, EITHER DIRECTLY OR INDIRECTLY, CAN BE MEASURED USING THE GROSS FIXED CAPITAL FORMATION (PMTB) DATA DERIVED FROM THE GROSS DOMESTIC PRODUCT (GDP) DATA. Based on the data, it can be seen that total private investment intended to support tourism activities is 3.83% from total investments of Rp 3,829.98 trillion. This tourism investment consists of private investments amounting to Rp 146.1 trillion or 99.73%, while the remaining 0.27% is done by the government. In this case, the government does not invest for the construction of buildings or infrastructures related directly to tourism activities, such as hotel buildings, restaurants and so forth. This is partly due to the minimum and limited government budget. In addition, the government also wants to provide the widest opportunity to the business and private sectors to take part and invest in the tourism sector. 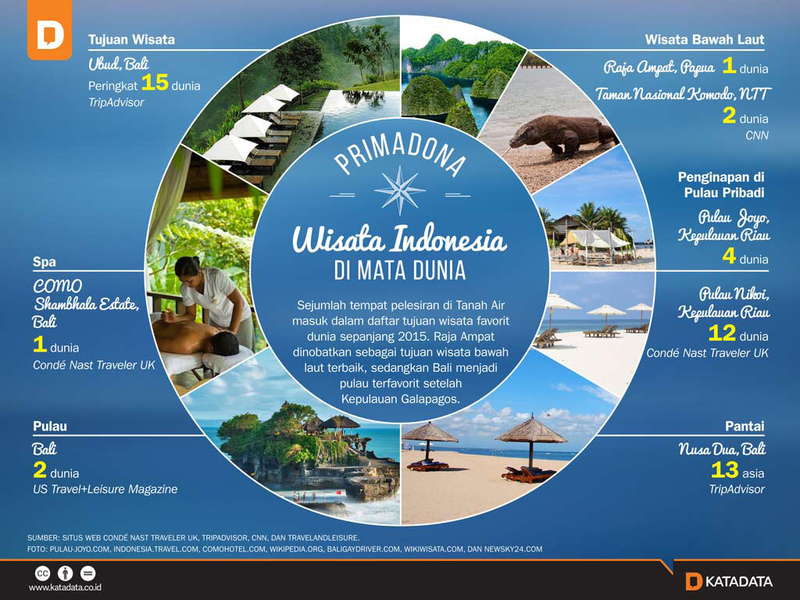 The private sector is expected to increasingly realize and understand the importance of tourism investment to seize the opportunity for more tourists to visit Indonesia in years to come. Tourism investment by the government and private sectors continues to increase significantly annually. The investments made by the government, mostly for machinery, equipment and transportation equipment amounted to Rp 233.54 billion (58.99%) and Rp 91.62 billion (23.14%), respectively. Slightly different from past years, where private investment was largely for infrastructure, hotel, and other accommodation developments, since 2015, the private sector has invested more on the construction of non-residential buildings worth Rp 30.50 trillion or 20.87 % of total private investments. Next is infrastructure investment amounting to Rp 26.33 trillion, hotel building and other accommodation amounting to Rp 25.30 trillion, as well as sports, recreation, art and cultural recreation of Rp 16.38 trillion. These investments include the addition of new hotels as well as the renovation of hotels and other accommodation, such as the construction of buildings for cultural and tourism activities. Overall, the largest investment is for non-residential buildings which reached 20.82%, and the role of the private sector is enormous in this sector. Next is investment for infrastructure, hotel buildings and other accommodation which reached 17.98% and 17.27% respectively of total investment.